Ten-man Sunderland came back from two goals down to earn a draw with West Ham, who also had a man sent off. Guillermo Franco turned in Jack Collison's cross to put the Hammers ahead, before Carlton Cole collected a Collison pass and doubled their lead. An Andy Reid free-kick pulled a goal back before Sunderland's Kenwyne Jones saw red for pushing Herita Ilunga. Kieran Richardson bundled home the Sunderland equaliser before West Ham's Robert Kovac was dismissed late on. The result brings to an end Sunderland's run of four successive home victories but the visitors will have cause to feel this was a game they should have won. Unsurprisingly, the home side looked the more assured side early on and they should have been ahead after five minutes but Darren Bent's stretching header from a Lorik Cana cross drifted past the far post. The early storm weathered, West Ham edged their way into the game and but for a superb parrying save by Craig Gordon in the Sunderland goal, Valon Behrami's 18-yard drive would have put them into the lead. The organisation and occasional enterprise shown by West Ham belied their lowly league position and it was no surprise when they took the lead. Collison broke the offside trap down the right and with the Sunderland defenders scrambling back to cover, his cross was inch perfect for Franco to side-foot his first Hammers goal. Minutes later, Sunderland were again indebted to their goalkeeper for keeping the deficit to one as Cole muscled himself the opportunity to swivel and shoot goalwards, forcing Gordon into a smart parry. In the 36th minute West Ham extended their lead and again Collison was key, winning the ball and driving towards the Sunderland box before feeding Cole, who took the ball in his stride and slotted in. Looking firmly in control, the fallibility that has so far afflicted West Ham's season came to the fore, giving Sunderland a route back into the match. Steed Malbranque was needlessly fouled by Kovac on the edge of the box and from the resulting free-kick, Reid flighted the ball over the wall and in to the top left-hand corner of Robert Green's goal. Sunderland's hopes of a comeback were dealt a blow though just before half-time when striker Jones was shown a straight red by referee Andre Mariner for pushing over Ilunga after the two had clashed in an aerial challenge. Sunderland's numerical disadvantage invariably gave West Ham chances to extend their lead in the second half, none of which they took. Early on, Gordon saved superbly from a Franco near-post header from a corner and Cole failed to hit the target when well placed. However, for much of the half it was Sunderland who looked like they had the extra man as they applied themselves to their task with vigour. Michael Turner's powerful header from a corner was superbly saved one-handed by Green and moments later Bent fired over after turning inside James Tomkins. When Green was not holding Sunderland at bay, the woodwork proved an effective understudy. In one attack, the home side twice struck the bar with headers; the first from Cana, the second a follow-up effort from Paulo da Silva. Sunderland refused to be denied, though, and with 10 minutes to go Bent found space on the right, his cross cleared Green via a deflection and Richardson was able to slide the ball in at the far post. With three minutes remaining, Kovac earned himself his second yellow with a late tackle on Bent to even up the numbers on the pitch. 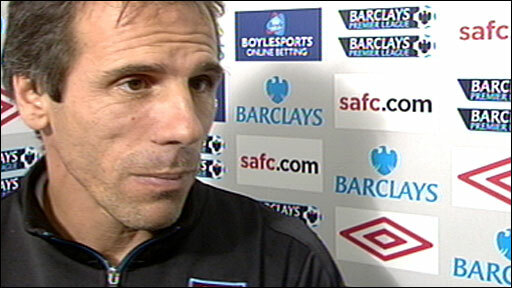 West Ham Manager Gianfranco Zola suggested last week's comeback against Arsenal to earn a 2-2 draw was like a win. This, however, will feel like a point gained as Sunderland's second-half performance failed to yield the result it deserved. "Kenwyne's wrong, he's pushed him but is there any need for Ilunga to go down like he does? "Referees have a difficult job but I think players have to look at themselves. 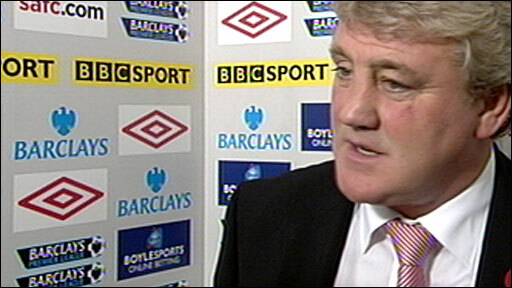 "Some of the stuff we played in the second half was terrific, you'd think West Ham had the ten men." "I'm not happy at all. We were in control of the game and I didn't expect them to come back. "The way we play sometimes is very impressive but we need to be more mature. "I was disappointed with Kovac's sending off because he didn't see Darren Bent." 90:00+4:33 The referee signals the end of the game. 90:00+3:56 Unfair challenge on Zavon Hines by Paulo Da Silva results in a free kick. Matthew Upson restarts play with the free kick. 90:00+2:49 A cross is delivered by George McCartney, clearance by Matthew Upson. 90:00+0:25 Jordan Henderson crosses the ball. 88:53 Mark Noble takes the chance to get an effort at goal. George McCartney manages to make a clearance. 88:30 Corner taken short by Mark Noble. 87:10 Effort from inside the area by Darren Bent misses to the right of the target. 86:28 Sent off Radoslav Kovac receives a red card for second bookable offence. 85:21 A cross is delivered by Jonathan Spector, clearance by Nyron Nosworthy. Free kick awarded for a foul by Radoslav Kovac on Darren Bent. Lorik Cana takes the direct free kick. 84:01 Jonathan Spector challenges Andy Reid unfairly and gives away a free kick. The ball is swung over by Andy Reid, Headed effort from deep inside the penalty area by Darren Bent misses to the left of the goal. 83:21 Alessandro Diamanti has an effort at goal from outside the area missing to the wide right of the target. 82:14 Darren Bent takes the chance to get an effort at goal. Robert Green makes a save. 81:25 Jordan Henderson is flagged offside by the assistant referee. Robert Green restarts play with the free kick. 80:09 Substitution George McCartney joins the action as a substitute, replacing Steed Malbranque. 78:34 Effort on goal by Zavon Hines from inside the box misses to the right of the target. 77:47 Carlton Cole has shot on goal from just outside the area which goes wide of the right-hand upright. 75:30 Assist on the goal came from Darren Bent. 75:30 GOAL - Kieran Richardson:Sunderland 2 - 2 West Ham Kieran Richardson gets on the score sheet with a goal from close in to the bottom left corner of the goal. Sunderland 2-2 West Ham. 74:52 Lorik Cana gives away a free kick for an unfair challenge on Zavon Hines. Jack Collison takes the free kick. 74:46 Kieran Richardson delivers the ball. 73:13 The ball is delivered by Kieran Richardson, Steed Malbranque produces a volleyed right-footed shot from deep inside the penalty box which goes wide of the left-hand post. 72:39 Andy Reid sends in a cross, Matthew Upson makes a clearance. 71:21 Direct free kick taken by Steed Malbranque. 71:21 Substitution Zavon Hines on for Guillermo Franco. 71:21 Alessandro Diamanti concedes a free kick for a foul on Nyron Nosworthy. 67:44 Carlton Cole gives away a free kick for an unfair challenge on Michael Turner. Free kick taken by Craig Gordon. 67:22 Jordan Henderson has an effort at goal. Save by Robert Green. 66:14 Substitution Alessandro Diamanti joins the action as a substitute, replacing Valon Behrami. 64:18 Outswinging corner taken by Andy Reid from the left by-line. Lorik Cana takes a shot. The ball is delivered by Andy Reid, clearance by Herita Ilunga. Andy Reid takes the inswinging corner, clearance by Valon Behrami. A cross is delivered by Kieran Richardson, James Tomkins makes a clearance. 63:07 Andy Reid produces a cross, save by Robert Green. 62:12 Andy Reid delivers the ball, comfortable save by Robert Green. 59:41 Craig Gordon restarts play with the free kick. 59:41 Booking Carlton Cole goes into the referee's book. 59:35 Free kick awarded for an unfair challenge on Michael Turner by Carlton Cole. 57:45 Lorik Cana gives away a free kick for an unfair challenge on Carlton Cole. The free kick is delivered right-footed by Mark Noble from right channel. 56:16 Inswinging corner taken from the right by-line by Andy Reid, clearance made by Matthew Upson. 53:49 Carlton Cole produces a drilled right-footed shot from deep inside the area which goes wide of the left-hand post. 53:19 The assistant referee flags for offside against Darren Bent. James Tomkins takes the free kick. 52:53 The ball is delivered by Andy Reid, save by Robert Green. 52:06 Carlton Cole gives away a free kick for an unfair challenge on Michael Turner. Craig Gordon takes the direct free kick. 50:57 Darren Bent produces a drilled left-footed shot from deep inside the area which goes wide of the left-hand post. 50:08 The ball is sent over by Kieran Richardson, James Tomkins makes a clearance. Effort from outside the penalty box by Lorik Cana goes wide right of the target. 48:43 Guillermo Franco takes a shot. Craig Gordon makes a save. 47:42 Drilled right-footed shot by Darren Bent. Comfortable save by Robert Green. Outswinging corner taken left-footed by Andy Reid from the left by-line, Michael Turner takes a shot. Robert Green makes a fantastic save. 47:26 Andy Reid delivers the ball, Herita Ilunga makes a clearance. 45:58 Outswinging corner taken right-footed by Mark Noble, Guillermo Franco takes a shot. Craig Gordon gets a block in. 45:23 Valon Behrami fouled by Jordan Henderson, the ref awards a free kick. Direct free kick taken by James Tomkins. 45:00+4:15 The half-time whistle blows. 45:00+3:28 The ball is sent over by Andy Reid, Jordan Henderson has an effort at goal from 20 yards. Valon Behrami makes a clearance. Outswinging corner taken by Andy Reid, clearance by Radoslav Kovac. 45:00+2:43 Corner taken by Andy Reid played to the near post, Carlton Cole makes a clearance. 45:00+2:08 Lorik Cana takes the free kick. 45:00+2:08 Booking Herita Ilunga goes into the referee's book. 45:00+1:14 Sent off Kenwyne Jones sent from the field by the ref for violent conduct. 45:00+0:53 Free kick awarded for a foul by Herita Ilunga on Kenwyne Jones. 44:33 Shot from outside the penalty box by Valon Behrami goes wide right of the goal. 43:54 Free kick awarded for a foul by Steed Malbranque on Carlton Cole. Mark Noble crosses the ball in from the free kick, Kenwyne Jones manages to make a clearance. 43:20 Andy Reid produces a cross. 43:11 The ball is crossed by Andy Reid, Matthew Upson makes a clearance. 42:43 Free kick awarded for an unfair challenge on Kieran Richardson by Guillermo Franco. Free kick taken by Lorik Cana. 42:00 Steed Malbranque concedes a free kick for a foul on Herita Ilunga. Free kick taken by Robert Green. 40:10 Corner from the left by-line taken by Mark Noble, clearance by Nyron Nosworthy. 39:24 Mark Noble crosses the ball from the free kick right-footed from right wing. 39:24 Booking Michael Turner is booked. 39:18 Free kick awarded for an unfair challenge on Guillermo Franco by Michael Turner. 38:14 GOAL - Andy Reid:Sunderland 1 - 2 West Ham Andy Reid hits the back of the net with a goal direct from the free kick from just outside the penalty box to the top right corner of the goal. Sunderland 1-2 West Ham. 36:50 Booking Radoslav Kovac goes into the referee's book for unsporting behaviour. 36:36 Steed Malbranque fouled by Radoslav Kovac, the ref awards a free kick. 35:11 Assist by Jack Collison. 35:11 GOAL - Carlton Cole:Sunderland 0 - 2 West Ham Carlton Cole gets on the score sheet with a goal from deep inside the penalty box to the bottom left corner of the goal. Sunderland 0-2 West Ham. 34:31 The ball is delivered by Andy Reid, save by Robert Green. 33:05 Shot by Carlton Cole. Craig Gordon makes a save. 32:45 Paulo Da Silva produces a cross, Radoslav Kovac manages to make a clearance. 31:39 Foul by Herita Ilunga on Steed Malbranque, free kick awarded. Steed Malbranque restarts play with the free kick. 31:05 Unfair challenge on Michael Turner by Carlton Cole results in a free kick. Kieran Richardson takes the direct free kick. 30:28 Kieran Richardson delivers the ball, Radoslav Kovac manages to make a clearance. 29:10 The assist for the goal came from Jack Collison. 29:10 GOAL - Guillermo Franco:Sunderland 0 - 1 West Ham Guillermo Franco gets on the score sheet with a goal from close in low into the middle of the goal. Sunderland 0-1 West Ham. 28:11 The ball is crossed by Andy Reid, Matthew Upson makes a clearance. Corner taken by Andy Reid, save by Robert Green. 27:10 The ball is delivered by Andy Reid. 24:46 Free kick awarded for an unfair challenge on Lorik Cana by Guillermo Franco. Michael Turner takes the direct free kick. 24:14 Booking Darren Bent is cautioned by the ref for dissent. 23:59 Free kick awarded for an unfair challenge on James Tomkins by Darren Bent. Robert Green restarts play with the free kick. 23:21 Nyron Nosworthy gives away a free kick for an unfair challenge on Guillermo Franco. Matthew Upson restarts play with the free kick. 23:14 A cross is delivered by Paulo Da Silva, clearance by Jonathan Spector. 22:30 Paulo Da Silva produces a cross, clearance by Matthew Upson. 20:10 The ball is crossed by Andy Reid, Darren Bent produces a header from inside the area that goes over the crossbar. 17:27 Carlton Cole concedes a free kick for a foul on Lorik Cana. Kieran Richardson takes the free kick. 16:48 A cross is delivered by Steed Malbranque. 15:47 Valon Behrami has an effort at goal. Save by Craig Gordon. Valon Behrami concedes a free kick for a foul on Kieran Richardson. Craig Gordon takes the direct free kick. 14:51 Carlton Cole produces a right-footed shot from just outside the box that misses to the right of the goal. 14:04 Free kick awarded for an unfair challenge on Mark Noble by Lorik Cana. James Tomkins takes the direct free kick. 12:52 Foul by Nyron Nosworthy on Carlton Cole, free kick awarded. Mark Noble crosses the ball in from the free kick, Kieran Richardson makes a clearance. 12:06 Free kick awarded for an unfair challenge on Lorik Cana by Carlton Cole. Lorik Cana restarts play with the free kick. 11:33 Paulo Da Silva has an effort at goal from outside the penalty box missing to the wide right of the target. 10:25 The free kick is swung in right-footed by Jack Collison, save by Craig Gordon. 10:25 Booking Lorik Cana booked. 9:53 Lorik Cana challenges Mark Noble unfairly and gives away a free kick. 8:35 Andy Reid sends in a cross, save by Robert Green. 7:49 Effort from 25 yards by Carlton Cole. Save by Craig Gordon. 6:47 Shot by Mark Noble. Craig Gordon makes a save. 6:39 The ball is crossed by Herita Ilunga, clearance by Nyron Nosworthy. 5:18 Kenwyne Jones has an effort at goal. Blocked by Lorik Cana. Lorik Cana crosses the ball, Darren Bent has a headed effort at goal from deep inside the area missing to the right of the goal. 3:10 Andy Reid produces a cross. 2:46 Unfair challenge on Valon Behrami by Steed Malbranque results in a free kick. Direct free kick taken by Jack Collison. 2:03 Steed Malbranque fouled by Valon Behrami, the ref awards a free kick. Free kick crossed left-footed by Andy Reid from left wing, Jack Collison manages to make a clearance.